With an Online Survey it is possible to collect various insights about your target group within a short time span. Participants can fill out the questionnaire online – even on mobile devices. This enables you to collect feedback from a large amount of users, and receive statistically reliable results. With an Online Survey, you can reach out to a high amount of users and gather answers to a multitude of questions. As opposed to On-site Surveys, in which only the current visitors of a website or application are surveyed, Online Surveys address the entire target group, including potential new users. We support you during the development, design, and technical implementation of the online questionnaire. 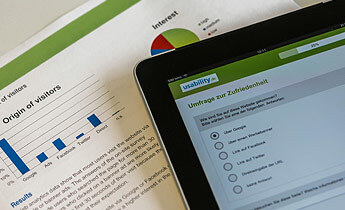 Thanks to responsive design, users can even easily take the survey on their smartphone. If you wish, we can also help you to recruit participants for the survey. Whether you are interested in demographic variables, attitudes, group differences, or more complex relations, it does not matter. Based on existing knowledge and on your research questions, our experts assist you during the whole process, from the development of the survey to its analysis and interpretation. During the analysis of the survey, we do not leave you alone with numbers and diagrams. We interpret the gathered data and support you with specific recommendations for further improvement. What can we find out with an Online Survey? How often are different digital devices (desktop PC, tablet, smartphone) used to access a website? What is the proportion of people with certain characteristics (e.g. interests and attitude towards the product, user needs, etc.)? New ideas for further improvement of your product were suggested during a focus group. Which idea is the most popular? Are there differences between subgroup A and subgroup B? How can you subdivide the target group? Which characteristics tend to appear together? Which features of the product are particularly important? Which features do users seek in a successful product? When do we recommend an Online Survey? You already have a rough idea of who your users are and now you want to know for sure? The best moment to conduct an Online Survey is when you already have some information about the characteristics and needs of your target group. With an online survey, you can verify and quantify your assumptions about the target group, but also gain new insights. If you still know very little about your users, the advantages of qualitative methods (e.g. in-depth interviews, focus groups) can be perfectly combined with the advantages of an Online Survey. In a first step, the qualitative approach helps us to come up with hypotheses, which can be verified quantitatively in a second step. An Online Survey provides insights about your target group within a very short time span. Large samples guarantee that the results from your sample are transferrable to your entire target group. Numbers and diagrams summarize findings and are quick and easy to get across. Statistical performance indicators (means, distributions, proportions, correlations, etc.) enable a precise description of the target group as well as comparisons between groups. We summarize the results in a structured report. We analyze the raw data for you, using state of the art statistical methods. Easily understandable diagrams visualize meaningful statistics. We interpret the results and show you which answers the data give to your questions. 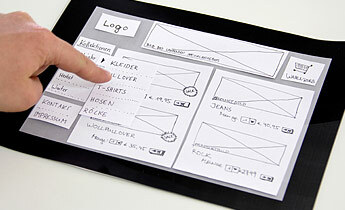 We further develop specific recommendations on how to meet the needs of your users even better. Do you have specific questions about your project? We will be happy to advise you. Free of charge and at no obligation.